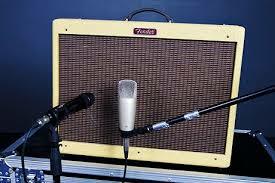 If you have ever recorded electric guitar before, then you probably know that simply sticking a mic in front of an amp and pressing record usually doesn’t yield the best sounding tracks. I always say get it right at the source and don’t settle for “fixing it in the mix”. A good guitar tone starts with the player, then the guitar, then the amp, and then the mic placement and skills of the engineer recording all the above. I’ve been there. You spend a lot of time with the guitar player tweaking the amp settings, and messing with the guitar pedals to get that perfect sound in the room, only to put up a microphone and the recording is muddy as hell. The good news is, once you’ve spent time with the player and the gear getting the tone you want, getting rid of the mud in the recording is not that hard, it just takes a little time and experimentation. One tip before I move forward with mic placement is that smaller amps may be better suited for you in a home studio environment. The reason is because they typically have less low end which helps them sit better in the mix once the kick and bass are in. Smaller amps also typically only have one speaker, so you know you are focusing on the main sound source. Smaller amps also break up at lower volumes, so you don’t have to push the amps as loud as you would on bigger setups. This may make your neighbors happy! Typically you want to be close to the grill of the speaker, maybe a few centimeters away. The closer you move the mic to the center of the speaker the more “brighter” it gets, and the closer to the outer edge of the speaker the “darker” it gets. So if you have super dark, maybe muddy tone, try moving it closer in towards the middle of the speaker. You would be surprised, just moving the mic 1 inch can make a dramatic change in the tone of the recording. You need to record a small take at one position, take notes on the placement, then move the mic and record anther small take. Listen to each different take and compare and contrast. You can test out as many positions as you like, but I always at least try 2, and pick the better one. This way you at least know you made some improvement on your sound. When I was taught how to mic a guitar amp, we experimented with moving the mic back from the amp. Maybe a few feet which will give you more of the ambient room sound. This could work great if you need that sound in your song. With the close mic technique, try angling the mic off axis a little so that the mic is at a 45 degree angle to the front of the speaker instead of straight on. This could yield some cool results. Here is a pic of the MXL 4000 that has a figure 8 pattern option. Then you should be fine. 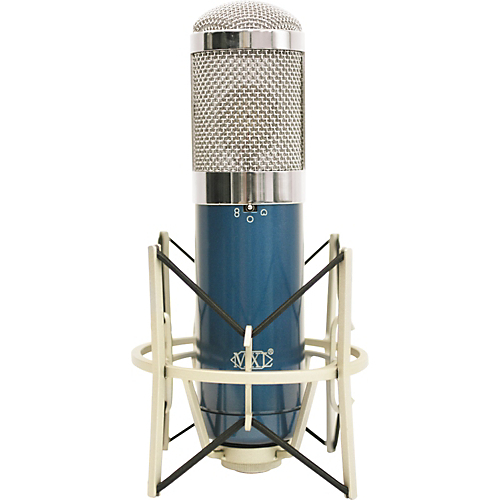 Check out this article of mine on the different types of microphones used in recording. Key is to experiment with mic placement and sound until you get the tone you want. Thats when you’re ready to record the final take! Please share and feel free to comment below. I’d love to chat.